In the aftermath of the shootings in Tucson much of the debate has centered on the extent to which the rhetoric of a toxic political atmosphere is to blame. 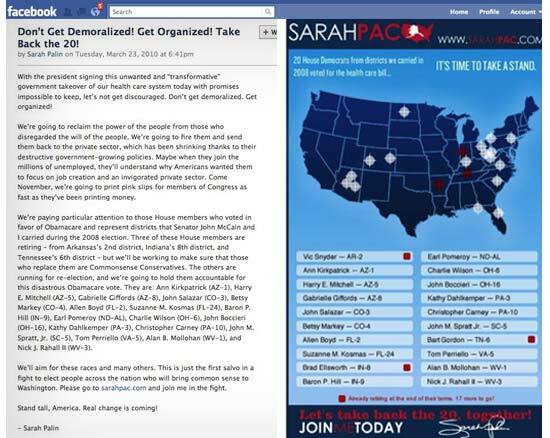 Almost immediately following the shooting at the Safeway people pointed to Sarah Palin’s now infamous map on Facebook that placed crosshairs over the districts of 20 house Democrats, whom she targeted for defeat in the 2010 mid-term elections—including the Tucson district of rep. Gabrielle Giffords. Then, there were references to Sharron Angle’s comments on “looking toward those second amendment remedies” if “congress keeps going the way it is.” Add to that the customarily incendiary language of such talk-radio/television personalities as Rush Limbaugh, Glenn Beck, Bill O’Reilly, Ann Coulter (and the usual cast of characters) and much of the country was—if not persuaded, then at least—challenged by Pima County sheriff, Clarence Dupnik’s, comments that “vitriolic rhetoric” is hurting America. Those on the political right, Charles Krauthammer and George Will, and even the usually circumspect, David Brooks, were quick to condemn any connection between the shooter’s motives and what the political left characterized as violent speech. How, they wondered, is it possible—let alone responsible—to assign blame to the conservative media for prompting Jared Loughner’s despicable act, when there is no evidence to suggest that he was incited to violence by listening to talk radio or watching Fox News? This is, I think, a fair question. Did Sarah Palin, Glenn Beck, Rush Limbaugh et al. make Jared Loughner pull the trigger? I don’t imagine anyone would want to make such an airtight connection. It seems obvious that Mr. Loughner struggles with mental illness. On the other hand, I take issue with the assertion that it is inconceivable that anything the media might say could push this guy (or anyone else, for that matter) to do something he didn’t want to do. Am I suggesting, for example, that I can find a bright line of causality between Sarah Palin’s crosshairs and Jared Loughner’s shooting spree? No. However, I do find the feigned outrage on the part of those in the conservative media who dismiss their ability to influence others disingenuous in the extreme. If Rush Limbaugh and Glenn Beck are so marginal, why is it that sponsors pay them millions of dollars to hawk commercial wares? I don’t see how you get to have it both ways by telling people who want you to sell their stuff, on the one hand, that you have the juice to influence people to buy stuff they wouldn’t otherwise buy (were it not for your amazing persuasiveness), while at the same time publicly demurring about your ability to influence people to buy political opinions about which you claim to be passionate. How is it that you can charge people big money to sell their merchandise, but your own political ideas (for which you are also being paid) nobody takes too seriously? The Media functions not merely as a mirror of reality; it also functions as—and is principally financed by its ability to act as—a shaper of reality. It would be nice to think that the Media persuades only when it pays, and not when it costs. Unfortunately for those negatively affected, it doesn’t always work that way. Right or Left, people who get paid to speak, don’t get to choose which of their words people pay attention to. And on a day when we celebrate the life and death of Dr. Martin Luther King, Jr.--a man who lived and died by his words--it seems important to point this out.